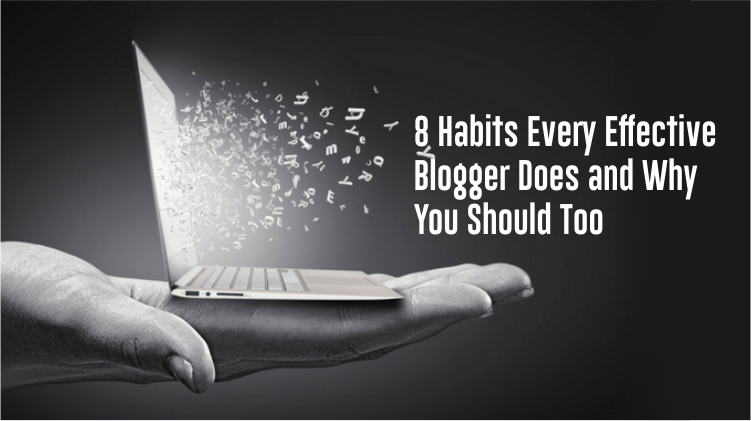 8 Habits Every Effective Blogger Does and Why You Should Too? Every Effective blogger started from zero…just like you and me. It took lots of time; hard work struggles to become what they are today. They went through tough times and sacrifices, but we can’t overlook their present status. Darren Rowse and Jon Morrow being the most famous names in the blogging niche. Coming on to Spencer Haws, who is an idol in the website building and marketing niche. If you have been pondering about the secret behind the success of these dignitaries to make up to such name, fame, love, revenue, and prosperity, here I dragged you to those seven attitudes that they built and grew every other day to reach up to success. These attitudes are the after effects of focused work and unlimited time spent in maintaining the blog by an effective blogger. When you start adopting a particular attitude regularly, it gradually becomes your habit and then success comes running to you. Not all the bloggers know about these insights and their implementation. You should go on reading this. No matter how tiring and hectic blogging can be, I know you always strive to make it all the more interesting and achieving. You want to prove it to everyone that your words are worth reading and sharing. So let’s then get commenced with the eight most productive habits to act. Unlike others, their passion is just writing instead of chocolate, alcohol, etc. They write continuously and are never satisfied with the quantity they write daily. They always have that urge to write more and more and eventually they become perfect without even realizing the fact. You too should develop this habit of writing anywhere and anytime. Just keep in mind that nothing is wrong or inappropriate. Every word or a phrase has its fortune, so keep writing and keep purifying yourself. The successful bloggers do not live in their imagination; they are always into observing their readers, viewers, and care to respond to them always. They study their visitors statistically and know about their sites, search engines, states and even countries. They know the most suitable time for their traffic, the relevant posts, and the best-suited audience. They are very careful about the headings and are in habit to advertise the content, timing, layout, and pictures of their post according to their viewers. And even know all the things they should do after publishing a guest post. There cannot be anyone more firm and stubborn as bloggers. That’s a fact, the bloggers will keep sticking on to just one topic or niche and would never let it go. They center their whole blogs on one single thing, and nothing in the world can move them from there. It is an excellent attitude that you must adapt. As an example, you can take a food blog and go on writing about the meals in your region. Write about restaurants, festive recipes, share images, famous dishes and everything else related to food of your area. Then slowly you can expand to other areas as well.The biggest proof is Brain Clark, in front of us, who is the founder of CopyBlogger and centered his blog on offering content marketing solutions and he is immensely successful in it. People who are reading your material, are not in search of only words, they are eager to be engaged with a community and to be able to interact with it. The great and effective bloggers are always responsive to the community that builds on their blog. The answers to the comments and questions, and in this way, the readers feel that they are being involved. These bloggers also keep good relations with other bloggers. They are active in conversing about the relevant and the recent issues. It encourages you to develop your ideas and promote your blog. Suggested post: How to Connect with your fellow bloggers? Another fruitful habit is to reply all day to their emails, reading and updating their profiles on social sites. It’s keeping them alive the same as the tea they drink. Because your good content is only beneficial when you are equally involved in its promotion and sharing. Therefore, follow this habit and keep on updating your profiles. Always be indulged in replying to comments, sharing, joining groups and writing emails. Be affectionate to whoever likes and appreciates your work. Bloggers go mad for the designs and patterns of their blogs. They always want their blog to be effective, efficient and attractive to the users. Be it background, layouts of the post, the color of text, font, pictures, subscription boxes, landing pages. They want each and everything to be perfect. It is undoubtedly the key to success. So you have to invest your time in your blog, this is what will bring you rewards and honor. Like in a fashion blog, if you write about female clothes, making color dominant red or pink to get their eye. It takes the time to build every great thing. As Rome wasn’t built in a day. Similarly, your blog also would grow gradually, and you have to expect realistically about it, Expect just the hard work for the first year. Instead of rushing, make something that would exist for a long, long, time. Though it will need lots of patience and focus, ultimately you’ll make it up. Remember, light is always at the end of the tunnel, but most of the people give up just before the end. So you have to keep going. Have you ever heard Jeff Goins talking to his readers??? He is so humble, always a learner, taking his fellow bloggers and always considering his readers first. You cannot afford to be rude or arrogant. Be confident and open to ideas or advice. You’ll have to develop a habit of listening if you expect the same from others. Nevertheless, these habits would eventually become your attitudes and would spread positivity all around. You will face all the struggles and hardships without even realizing them. And ultimately you’ll have the success. So try to follow these habits. If not all, at least some of them. If you want to rock the blogging world. How start a blog of your own? Well I believe being a long lasting learner and being analytical are an unquestionable requirement when it comes to blogging. An effective blogger is interested in learning – I learn something new every day even from so-called lower ranking blogs – there are educational opportunities in even the most unlikely places. Thanks for this amazing post full of informative and inspiring words, Its sound like be a community. I will go for #4 because I want to build relationships, without relations there is nothing left in blogging. Have a Good day. Thanks for stopping by and dropping the comment. I am happy that you liked the post. I agree on your thought and I want to add the most important trait a long term blogger can employ consistent ethics. Being true to yourself translates into being honest with your readers. Honesty builds trust, relationships, and everyone wins. Have a nice day ahead. Thanks for reminding these habits, I have written a post on the similar topic, and I see you have done an amazing job here. As a blogger we should create a content that inspire others to take the right decision and keep moving. I would love to link this site as an additional resource at my blog. Thanks for Appreciation and dropping the comment. I am glad that you want to link my write-up on your blog. Can you please share your article link, i would be happy to read. I agree with first “Inspiring bloggers never stop writing” line.. I have noticed to so many popular bloggers those have been wring more than 4 years & they have passion to write attractive articles. You are right, The most important trait of a top blogger is Persistence fuelled by passion. Great article to publish before the beginning of 2017. We are all trying to get the facets of our lives into perspective and set priorities. This was a great help to me. Thanks! Being consistent is the hardest thing to do. Especially when you are on your own .The slightest problem can derail you easily and you lose all that momentum. This is something that I personally struggle with a lot. Humility does send bloggers far. And you can’t also do without the rest. Networking and building good relationships all demand a humble spirit. Persistence, too. Thanks for bringing to mind these very important traits bloggers must have. Glad you found it useful. And welcome! It is really a very interesting post and it provides us a opportunity to learn something extra from it. A good blogger always dedicated to hardworking for better achievement in life. Regular writing habit very helpful for blogger to enhance their communication skills. Blogger should have tendency to thrive healthy relationship with people in order to maximize the productivity level of website. Eventually, thanks for sharing your worthy thought with us. It was a pleasure to read your article. I do agree with you on all the points. Building relationship and networking are very important if we want to become successful bloggers. I would say your Network is your “Net Worth”. Also, being persistent is the key point. It reminded me of the fact that a river cuts through rock, not because of its power, but because of its persistence. Thank you for sharing this wonderful article. Looking forward to reading more articles from you.